While the full extent of her crimes may never be known, Miyuki Ishikawa, who would come to be known as Oni Sanba (“Demon Midwife”), is estimated to have been responsible for the deaths of over 100 newborn babies in her care. In the economic turmoil of postwar Japan, many of the poor couples at the Kotobuki maternity hospital where Ishikawa served as director, could not afford to raise their new babies. Ishikawa’s “solution” to this was a truly heinous one—allowing the babies under her care to starve to death. With the help of her husband and the hospital’s physician, Ishikawa arranged to falsify the death records for the babies she had killed through neglect. Ishikawa’s accomplices also solicited payments from the parents of these infants. The horrific “murder mill,” was uncovered when police accidentally found the remains of five infant victims, and later discovered more than 70 additional bodies. Ishikawa’s argument that the true perpetrators were the parents who abandoned their infants apparently had some resonance with the court—she was initially sentenced to only eight years for her crimes, and that term was reduced to four years on appeal. Reportedly, this case led the Japanese government to reconsider its ban on abortion. The year after Ishikawa’s crimes were brought to light, abortion for economic reasons was legalized in Japan. Police in Mexico City initially suspected that the serial killer who was preying on the city’s elderly women–with more than 40 victims, by some estimates–was a man. The killer, who had been dubbed “Mataviejites” (“Little Old Lady Killer”) had been seen leaving a victim’s home. Witnesses reported that the killer had been wearing women’s clothing, but had a heavier frame. The killer won the trust of victims by posing as a helpful neighbor, nurse, or social worker, then entering the homes of the women, who lived alone, strangling them (usually with their own clothing or a stethoscope) and leaving with a small trophy (often a religious statue). Police searched for the killer for a couple years, even harassing local transvestite groups, but had no luck finding the man they believed was responsible. The mystery was finally solved when a returning tenant witnessed the killer fleeing the scene after murdering the tenant’s 82-year-old landlady. The tenant called the police and they quickly apprehended the person behind the killings–and it wasn’t who they were expecting. Instead of the man in drag the police had been searching for, the culprit was a woman: 42-year-old Juana Barraza, who worked part-time as a professional wrestler. Barraza, who denied responsibility for all but one of the murders attributed to her, attributed her crime to lingering resentment towards her abusive mother. She was sentenced to more than 700 years in prison for the murders of 11 women, though she is suspected to have logged dozens more victims before her capture. Victorian England was not a place that welcomed unmarried single mothers. Women who gave birth out of wedlock and couldn’t financially support their children didn’t have many options. One of these options was to turn to a “baby farmer,” a woman who, in exchange for a fee, would take in and care for the child and/or place it for adoption. Unfortunately, some unscrupulous women determined that they could pocket the money paid by the birth mother without actually following through on ensuring a good future for her newborn. The worst of these women was a former nurse named Amelia Dyer. Dyer would place ads in the paper that proclaimed a childless married couple was seeking an infant to raise, along with a payment (one ad specifies 10 pounds as the amount sought). Then she would take custody of the baby. Initially, it appears that she killed her young charges through administering opium-laced medications and underfeeding. She even served six months of imprisonment for neglect, after a doctor became suspicious after numerous babies died in Dyer’s care. Unfortunately, jail didn’t stop Dyer. Upon her release, she returned to her murderous ways, though she had learned to conceal her crimes; she moved frequently, used several names, and disposed of the babies’ bodies on her own. She was caught when the bodies of two babies, which she had packaged and thrown in the Thames, floated to the surface, and identifying information on the packaging was tied to one of her aliases. After first attempting suicide in police custody, Dyer eventually confessed, adding a chilling detail for police investigators. “You’ll know which ones are mine by the tape around their necks,” Dyer reportedly said, indicating that she had used tape to strangle the babies. A jury took only five minutes to decide to convict Dyer and sentence her to death for her one of the murders. On June 20, 1896, Dyer was executed by hanging for this murder, though it is estimated that she was also responsible for the deaths of hundreds of other infants. Leonarda Cianciulli struck most folks in her small Italian town of Correggio as a kindly middle-aged woman who ran a small shop in town and doted on her four children. When you hear “murderous cannibal,” Cianciulli is not whom you picture, but nonetheless, that is exactly who she became. Cianciulli had lost several pregnancies as well as several children early in their childhoods, and was extra-protective of her remaining brood. Reportedly, when a fortune teller told Cianciulli she would need to kill to protect her remaining children, Cianciulli took it to heart. When, in 1939, it appeared Cianciulli’s beloved eldest son would be joining the army in the lead up to WWII, Cianciulli went to work. From 1939 to 1940, Cianciulli lured three middle-aged women into her shop, offering them advice, saying she had found the first one a husband and the latter two jobs. She encouraged the women to tell everyone they knew that they would soon be leaving to move to distant cities to begin their new lives. Then, one by one, she invited them over for a meal before their planned departures, knocked them out with drugged wine and killed and dismembered them with an ax. Disposing of the bodies might have presented a problem for another woman, but Cianciulli had soap-making equipment at hand and used the caustic soda to melt them down in her soap-making pot, using the blood as an ingredient for cookies. Cianciulli details the process in her confession, saying, “I made lots of crunchy tea cakes and served them to the ladies who came to visit, though Guiseppe [Cianciulli’s son] and I also at them.” Cianciulli became better with practice, saying she was able to produce “some most acceptable creamy soap” from the remains of her third victim and that, “The cakes, too, were better. That woman was really sweet.” Cianciulli’s crimes were discovered after the sister-in-law of the third victim spotted her entering Cianciulli’s house, but not exiting, information which she shared with the police after her sister-in-law went missing. After her killing spree came to light, Cianciulli became known as the “Soap-maker of Correggio.” She was sentenced to 30 years in prison and died in 1970 in a criminal asylum. Like Amelia Dyer, Dagmar Overbye was a “baby farmer” with a dark side. Her killing spree, in 1920s Copenhagen, Denmark, followed a similar trajectory to Dyer’s, though it may have begun with the murder of her own child, who died under mysterious circumstances. Overbye claimed to be an adoption facilitator, taking unwanted children from poor women, who paid Overbye a year’s wages to find their child a loving home. However, instead of arranging for adoptions, Overbye murdered the children, usually by strangling them, disposing of their bodies by burying them, hiding them in the attic, or baking them in her oven, a practice that resulted in her nickname—“the Vesterbro baby burner”. Overbye’s murderous business went on undetected for 7 years, and claimed an estimated 25 infant victims, and it could have gone on longer. However, one birth mother, Karoline Aagesen, had a change of heart the day after she left her newborn daughter with Overbye. When Overbye claimed not to remember the address of the adoptive couple with whom the child supposedly had been left, Aagesen became suspicious and reported Overbye to the police. Upon visiting Overbye’s home, the police discovered the baby’s discarded clothing as well as remains of an infant’s skull and bones in the stove. Overbye was arrested for murdering 16 children, though only convicted of 9 deaths because evidence was lacking in some of the cases. She was sentenced to death for her crimes, though the Danish king later commuted her sentence to life in prison. Overbye died in prison in 1929. Belle Gunness may have looked like a big-boned, plain Midwestern farm wife, but her charms were evidently sufficient to lure dozens of men to their deaths at her hands. It isn’t clear Belle Gunness started out as a killer. She likely began with arson and insurance fraud, as she and her first husband collected on insurance proceeds when their struggling candy shop, then their home, burned down. But Belle appears to have moved on to murder fairly quickly, with two of the couple’s four children dying as infants—infants on which Belle and her husband held life insurance policies, on which they collected. Her first husband wasn’t long for the world either, dying on the only day of the year in which his two life insurance policies were in effect, of what a local doctor called heart failure, but which also could have been poisoning. Belle took her newfound wealth and bought a pig farm in Indiana, marrying a local widower. The widowers infant daughter died mysteriously shortly after the wedding and then Belle’s new husband died in a tragic accident with a meat grinder. If you’re guessing that Belle had a life insurance policy on him, you are correct. From there on out, she catfished, then murdered, a series of men by placing ads in Norwegian language newspapers implying that she was seeking a man with whom to share her life—and her farm. When the lovestruck men showed up with their life savings, Belle poisoned them, chopped up their bodies, and then either buried them or fed them to the hogs. When one suitor’s brother started digging into the details of his brother’s disappearance, Belle’s home burned to the ground. Four bodies were found in the charred remnants of the home—3 children corresponding in size to Belle’s children, and a headless woman. The woman’s frame appeared smaller than Belle’s, but some of Belles false teeth were found near the body. Investigators combing through the farm looking for the body’s head didn’t find it, but did find other human bones, teeth, a bunch of men’s watches, and several bodies. They conclusively unearthed 14 bodies, and estimated that the total body count may have been as high as 40. As for Belle, she may have gotten away with it. Her bank accounts had been almost completely emptied shortly before the fire and a handyman, who had been Belle’s on-again-off-again lover and accomplice in disposing of her suitor’s bodies, claimed that Belle had killed a maid she had recently hired and left the body in the house before burning it to the ground. 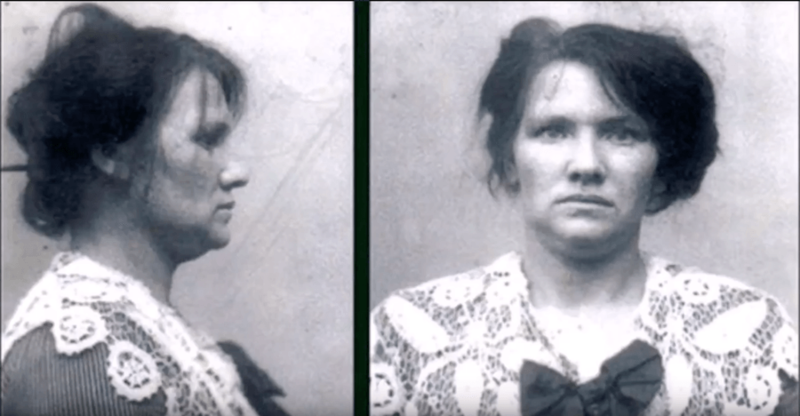 More than 20 years later a woman named Ester Carlson, who looked an awful lot like Belle Gunness, was arrested in Los Angeles for poisoning a Norwegian-American man for his money. She died while awaiting trial, and the truth about what ever happened to Belle Gunness may have died along with her. The cheerful demeanor Jane Toppan displayed during her nursing work earned her the nickname “Jolly Jane.” But Jane wasn’t “jolly” to cheer up patients who were suffering and dying; Jane was jolly because her patients were suffering and dying, sometimes at her hands. After her arrest, Toppan admitted to 31 murders, saying that she derived sexual pleasure from the life or death power she held over patients. Toppan’s landlord and, later, his wife were among Toppan’s earliest victims. She also killed off friends (so she could assume their jobs), subsequent landlords, and patients. When her landlord’s wife came to collect on past due rent, Toppan poisoned her, then killed the landlord as well as the landlord’s two daughters. She had finally gone too far. The father-in-law of one of landlord’s daughters was suspicious that four members of a seemingly healthy family could die so suddenly. He had the family’s bodies exhumed and evaluated by a toxicologist; testing revealed that the man’s daughter-in-law had died of atropine and morphine poisoning. Shortly thereafter, on October 29, 1901, Toppan was arrested for murder. She confessed to 31 murders (though she is suspected of up to 100 in total), but was found not guilty by reason of insanity, eventually dying at the hospital to which she had been confined. By the time police were called to the house on October 26, 1965, it was too late for her. Sylvia’s mangled body was found on a filthy mattress, and her sister begged police to to get her out of the home, and told them the whole story. Gertrude Baniszewski was tried, along with several of her children, for the torture and murder of Sylvia Likens. Baniszewski was sentenced to life in prison, but was released for good behavior, after serving less than 20 years of her sentence. Delphine LaLaurie, a wealthy Louisiana socialite, was well-known in antebellum New Orleans, both for her beauty and the lavish events she and her husband hosted. However, in the early 1830’s, she was in the public eye for a different reason—the cruelty she displayed towards her slaves. The first incident came in 1833, when LaLaurie, enraged that a 12-year slave girl who had been brushing her hair hit a tangle, chased the girl with a whip. The terrified girl ran off the roof to her death. LaLaurie tossed her body in the well. Investigators made her pay a fine and sell her slaves, but she quickly bought them back. On April 10, 1834, LaLaurie’s French Quarter mansion caught fire, possibly as a suicide attempt by the slave who was found chained to the oven. A gathering crowd noticed Delphine running to save her possessions from the fire and wondered where her slaves were, a question which Delphine would not answer. Bystanders quickly realized that the slaves were trapped in the attic of the home, which was locked. According to the local paper, “Several gentlemen impelled by their feelings of humanity demanded the keys which were refused to them in a gross and insulting manner.” When the men finally got in, “the most appalling spectacle met their eyes. Seven slaves more or less horribly mutilated were seen suspended by the neck, with their limbs apparently stretched and torn from one extremity to the other.” Even in the context of a time when slavery was commonplace, LaLaurie’s cruelty apparently stood out. When word got out about the abuse the slaves had suffered, a mob quickly formed and destroyed the homes’ contents. The Lalauries quickly fled, apparently leaving New Orleans and perhaps the country, and little is known of their subsequent lives. Reports suggested that at least two of these slaves died of their injuries after their rescue, and that other bodies were also found on the grounds of the property. Darya Nikolayevna Saltykova, commonly known as Saltychikha, was another noblewoman with a dark side. A young Russian widow, Saltykova had inherited her husband’s sizable holdings in 1756, which included a number of serfs. Saltykova was reportedly a very unhappy woman with a volatile temper, which she was prone to taking out on female serfs. Reportedly, Saltykova beat them, mutilated them, poured boiling water on them, threw them outside without clothes in the freezing winter. More than 100 serfs are estimated to have died at her hands. Because Saltykova had powerful political connections, it took a long time for her to be brought to justice, despite the mounting body count. Finally, in 1762, Empress Catherine II ordered Saltykova’s arrest. A 6-year investigation followed, noting as many as 138 suspicious deaths connected to Saltykova. Saltykova was eventually found guilty of torturing 38 female serfs to death. She was sentenced to be chained on a platform in the center of Moscow for an hour, wearing a sign around her neck saying “I have tortured and murdered,” after which she spent the remainder of her life imprisoned, spitting and waving a stick at people who passed by her cell. I’m surprised that Princess Elizabeth Bathory Dr Ecsed didn’t make the list.